As the only black student in boarding school, he was called names behind his back and cruel words were slung in his face. He fought back with words and by excelling in both academics and athletics. When he graduated in 1967, he enrolled in seminary with the aim of becoming a priest. When Martin Luther King, Jr., was assassinated the following year, he set out on the path that eventually led to his appointment to the Supreme Court in 1991. 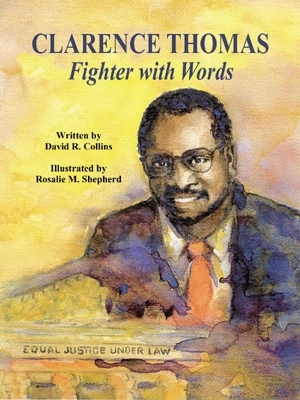 Though the road from Georgia to the Supreme Court was not an easy one, Clarence knew that his greatest strength lay not in the power of his fists, but in the strength of his words. The late David Collins (1940-2001) wrote over sixty books for young readers and was an admired and respected educator. Believing that children can never have enough role models, Collins was dedicated to writing biographies for young readers to educate and entertain. His four previous books with Pelican bear this. Casimir Pulaski: Soldier on Horseback, Hero on Horseback: The Story of Casimir Pulaski, Tiger Woods, Golf Superstar, and Tiger Woods, Golfing Champion have all earned praise from such publications as School Library Journal, the Book Report, the Polish American Journal, and the Catholic Post. Illustrator Rosalie M. Shepherd is a well-known landscape and portrait painter, employing oils, acrylics, charcoal, and watercolors. Her work has been featured in the Peabody Language Development kit, used internationally by educators to teach language skills. She has worked extensively as a graphic designer and is also the illustrator of The Tuskegee Airmen Story, Tuskegee Airmen: American Heroes, and Girls Fly!, all published by Pelican.